MACOM’s InnovationZone to Feature Industry Leaders in Cloud Data Center and 5G Connectivity Solutions at OFC 2019 | MACOM Technology Solutions Holdings, Inc. 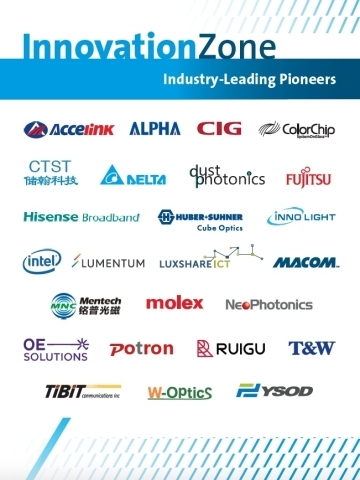 The InnovationZone will showcase industry leaders such as Accelink, Alpha, CIG, Colorchip, Cube Optics, Delta, Dust Photonics, FOC, Hisense, Innolight, Intel, Lumentum, Luxhsare-ICT, Mentech, Molex, NeoPhotonics, OE Solutions, Potron Tech, Ruigu, T&W, Tibitcom, Tsuhan, W Optics and YSOD plugged into live and static switch demonstrations. “MACOM’s InnovationZone is the first of its kind, and an opportunity for industry vendors to demonstrate interoperability for next generation networking solutions. ColorChip is excited to participate and contribute our SystemOnGlassTM 100G 2km and 10km solutions to this demonstration,” said Yigal Ezra, CEO of ColorChip. MACOM’s new InnovationZone serves as testament to the company’s continued leadership as the leading component supplier and enabler for Cloud Data Center and 5G applications. With a broad portfolio of products and wealth of technological expertise, MACOM is positioned to continue to enable the industry at every speed and feed. Visit MACOM’s InnovationZone at OFC 2019, Booth #2739, March 5th-7th in San Diego. To make an appointment, contact your local sales representative. For more information on MACOM’s optical networking solutions visit: www.macom.com/applications/optical-networking.